The location was in the drive entrance in front of a very nice upper mid range priced hotel in Crystal City, Virginia. The "Take It!" came from my long established habit of walking with eyes watching where I am placing my feet and where the next steps will help best bring me to where I want to go. 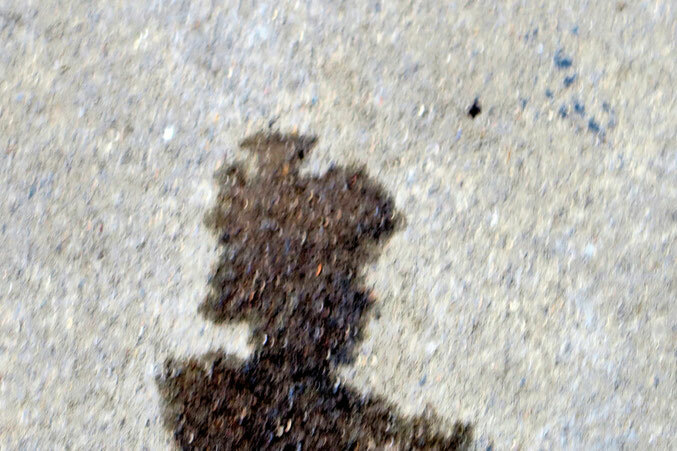 This delightful figure head was the result of the condensation of water dripping from an air conditioning unit in a vehicle that had recently departed from the driveway thus leaving this part of the pathway open to me. I have to confess that this head and shoulders was the best part of the ever so random water painting. The image had a correct back all the way down to there being legs and feet that were reasonably in proportion ( note legs would not have been in keeping with the usual Geisha dress code). The difficulty that kept this from being a full figure was the drip placement on the front made her look like she had taken about 6 small lightning bolts to her stomach area - which I could not crop out with focus and placement of the camera. So, the head and shoulders is what we have left to enjoy. The After Take: I showed this to numerous people, and prefaced the showing with telling them the short rendition of what they were about to see before introducing them to the image. This setting of the stage, so to speak, made all the difference in the world in their being able to be able to join me in the sharing of imagination. Again, the question/statement of the wonder of how I would see such a thing came up more than a few times. I respond by letting them know I am spending so much time on being the scout for my feet, that I am beginning to be able to be able to sometimes see more than just surfaces. Hoping you are enjoying some cooling temperatures as fall is trying to make its way to the grand stage. Heh, good one. I can definitely the Asian influence, a person from the shoulders up. I can't seem to make this one out. I can see it!! Oh that is just great! It took another set of eyes but I got it. My wife sat down to take a look and post after I finished. She came in talking about it and I told hher I couldn't see it. So we brought it back up and she showed me. I can see where the explanation really helps people. Reading the title and the post helped me.. This is so fun. When the pictures are like these I enjoy trying to spot it on my own before reading the title or your words on it.